Now, don't forget that today is the last day to place an order with me for £25 or more and qualify for entry into my Christmas prize draw to win the blog candy at the top of my blog. I've been putting all your names into a tin and tomorrow one ticket will be drawn out. If your name is on that ticket, you will win a beautiful Stampin' Up bag, the One of a Kind stamp set, a pack of assorted 12"x12" double-sided designer paper and three metres of beautiful wide striped grosgrain ribbon. Will it be YOU?!!! Ah! That's a much healthier looking robin! It's really quick and easy to make him - click here for my video tutorial. To get the wood effect I drew wavy lines round the assembled box with the thin end of a Chocolate Chip marker and then sponged the box with Chocolate Chip ink. The roof was smeared all over with a versamark pad, then covered in heat and stick powder. After pouring the excess powder back in the pot, I heated it until the roof was tacky the poured dazzling diamonds over it. Again, the excess glitter went back into the pot to be re-used and I heated the glitter to set it. Heat and stick powder is great because it ensures that the glitter doesn't come off at all - I'm not a fan of opening a card and being covered in a shower of glitter! If you have been one of my hostesses this year, you will be receiving one of these little treat boxes, filled with something yummy! It's my way of saying thank you for all the fun we've had. Next week, I'll be showing you the last of the Christmas projects - and I'll be turning my mind to those all-important thank you cards for after Christmas. Do come and join me! You've been busy over the last few days. I love the little chocolate wrappers, and the star gift set is very sweet. As for the bird house - charming!! Snow has arrived here in North Wales - it's not too bad at the moment, but not looking good. Don't like snow! totally cute! i think that could be a possible christmas gift for some friends of mine! I love these birdhouses. My Christmas tree (and my Mums too) is covered in them. They are so festive. I love the wood effect you have created on yours. Very lovely. That's so sweet vicky, love those little treat boxes and you're is just gorgeous. All Christmasy in the snowy tree. Very nice you did a nice job tfs!!! 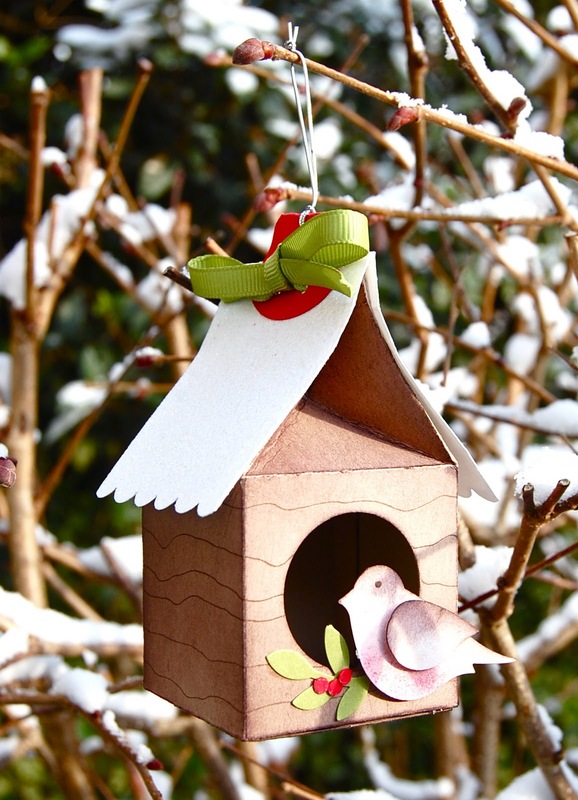 This is the most fab 3D paper bird house. I love the sparkly roof and the bird sitting in the doorway. What a great treat box or decoration.